Fun and jazzy, perfect for special occasions, holidays or even a day at the beach. 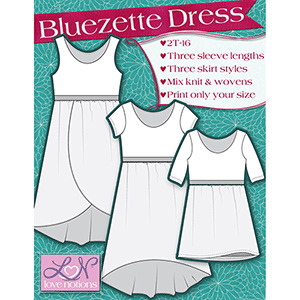 The Bluezette Dress was designed with tweens in mind but is also appropriate for younger girls. Three views are included. View A features a tulip skirt, view B features a high-low hem and view C is a classic gathered skirt dress that hits just above the knee. This is the perfect pattern to use those gorgeous silk-like and flowy fabrics. All three views include an under-skirt. The bodice is meant to be sewn with knits and is a slim fit that hits at the natural waist. Three sleeve lengths are included as well: tank, cap and elbow. Create a coordinating belt with the tips given to complete your look. This is the girls version of the Ladies Bluezette Dress. 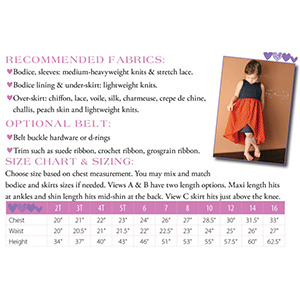 Suggested fabrics are light to medium weight knits such as cotton jersey, cotton lycra or specialty woven on the overskirt.